QPR star Adel Taarabt has claimed that his agent is in talks with AC Milan chief executive Adriano Galliani regarding a potential move to San Siro. The Morocco international has impressed at Loftus Road this season and has consequently been linked with a move away from the struggling west London club. Taarabt says that only a move to AC Milan would tempt him to turn down the advances of top English clubs as he sees the Serie A side as a potential stepping stone to a move to Real Madrid or Barcelona. 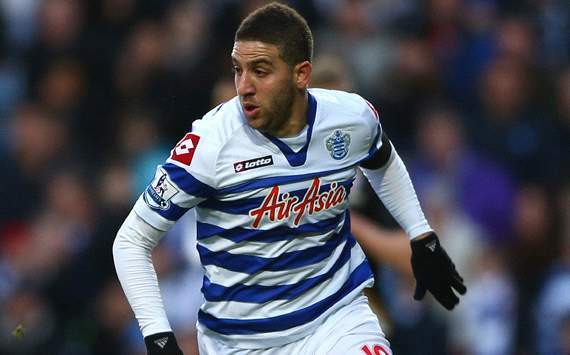 "I would only refuse offers from the big English clubs if Milan made me an offer," Taarabt told Gazzetta dello Sport. "My agent is in talks with Galliani, but it depends on what happens with Robinho and [reported AC Milan target Javier] Pastore. "Milan aren't going through a glorious period now, and they're no longer a part of the top clubs. However, if I joined Milan then it would open up the doors for me to great clubs like Real Madrid and Barca." Taarabt believes that the success of Kevin-Prince Boateng in Milan is proof that he could succeed with the Italian giants. The 23-year-old played with the Ghana midfielder at Tottenham but both struggled to make an impact on the first team at White Hart Lane before being sold. "My friend Boateng is also at Milan," he added. "When we were at Tottenham he was often in the stands, so I think that I have a chance too."